We Welcome You To Munchkinland! Nessarose Thropp is the name of the woman who becomes the Wicked Witch of the East in Wicked: The Life and Times of the Wicked Witch of the West by Gregory Maguire, as well as in the Broadway adaptation, Wicked. She is the spoiled younger sister of Elphaba, the Wicked Witch of the West. In both the play and the novel, Elphaba is considered a pale second to her beautiful but handicapped sister. Elphaba is often expected to put the needs of her sister before her own. In the novel, Nessarose and Elphaba have a younger brother named Shell. Nessarose, during her rule of Munchkinland, is dubbed "The Wicked Witch of the East", for her cruel ways and use of sorcery to control her subjects. In both the musical and the novel, Nessarose meets her demise when Dorothy's house lands in Oz and crushes her. In Maguire's novel, Nessarose is a very pious and religious character. She was born without arms, presumably from medicine her mother took to prevent another child with the same odd appearances as the green-skinned Elphaba. Despite her condition, she is a dainty and beautiful girl, and when attending Shiz University, she more easily gains friends than her sister. She is aided by Nanny at home. 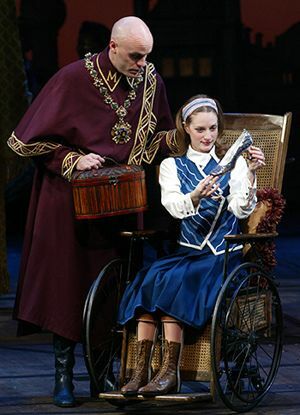 Nessarose, despite her pious religious convictions, is often close-minded and vain, in following with Maguire's cynicism throughout the novel towards religion in general. 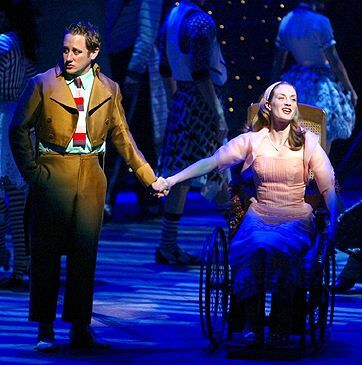 Unlike in the musical version, Nessarose is not infatuated with Boq, the Munchkin boy, and lives a solitary life. Nessarose is chosen by Madame Morrible to be an Adept – a trained sorceress, with political authority over a particular area (which was supposed to be in the South, Quadling Country). During Nessarose's reign in Munchkinland, despite her religious conviction, she allows more ancient practices to take place - including ritualistic sacrifice, rumoured to even include those of humans and Animals. Also, the book states that it may have been a spell the Nessarose cast on an axe, that backfired and turned a Woodsman into the Tin Woodsman. Nessarose is the original owner of the magical silver shoes (most commonly known as the ruby slippers from the 1939 film The Wizard of Oz), given to her as a loving gift by her father, and later enchanted by Glinda (in the musical adaption, the bespelled shoes are Elphaba's doing). They allow Nessarose to walk and stand without assistance, and leave her overly confident and more proud, which only fuels her tyrannical reign over the Munchkins. In the novel, the shoes are a lasting symbol of Elphaba's rejection by her father, and from the world in general, and a symbol and sign of fear and later reverence by the citizens of Oz. It is Elphaba's search to retrieve Nessarose's shoes from Dorothy that causes her demise, as she becomes obsessed with obtaining the objects that have always existed as a reminder to her unusualness.
. . . with her jewelled shoes! Everything happens for a reason. It's clear Wicked the Musical proves yet another astonishing fact! In one of the opening scenes the father of Nessarose is giving pair of SILVER SHOES to his daughter. Nessa loves her shoes, and one day years later she follows in her father's footsteps, as he was Governor of Munchkinland, she take it upon herself to become the Wicked Witch of the East and she rules Munchkinland. In Gregory Maguire's book Frexpar Thropp was the Eminent Thropp, and it was known that Melena wife to Frexpar took a position beneath her family and self thus, marrying Frexpar. He did put together made the shoes, sending his daughter silver shoes to Shiz University. However, they held no charm until many years later when Glinda put a spell on the shoes, giving them magical powers after Frexpar repaired them for they were falling apart. In Wicked the Musical, Elphaba Thropp now the Witch of the West goes to see her sister Nessarose a few years after she had fallen to the dark side and became a witch, in haste uses the Grimmerie and recites a spell to give life to her sister's crippled feet. Because she had done this the silver shoe's (due to a red spotlight) turn into Ruby Slippers after Elphaba puts a spell on them to make them magical as Glinda had done in Maguire's book. In Baum's original tale the shoes were SILVER!
. . . at the Oz Dust Ballroom at Shiz ! To the East of the Land of Oz is a country laced in the color of blue called Munchkinland. 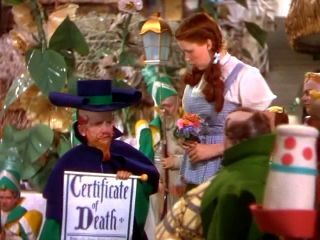 It was given this title by the 1939 movie The Wizard of Oz. 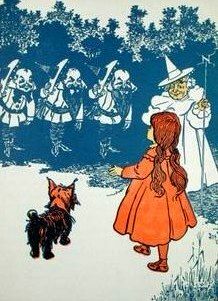 In the book published in 1900 Munchkin Country is distinguished by the color blue, which is worn by most of the Munchkins as well as the color of their surroundings in the Oz book series. 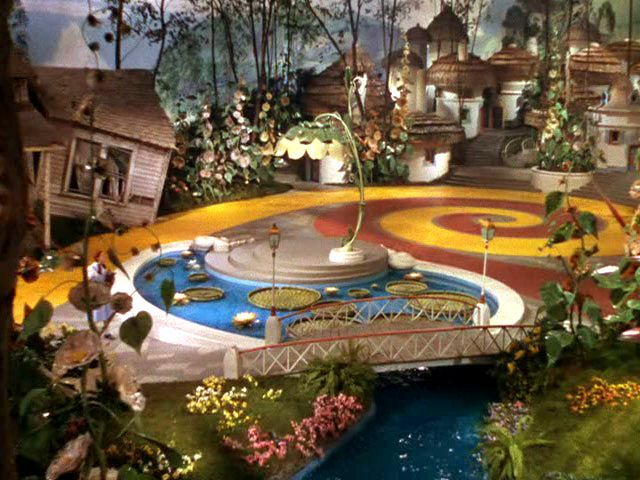 The 1939 film turned Munchkinland into the most beautifulscene in movie history. Technicolor back in the day, thrived on every color to enhance this special scene a magical one indeed. This land is a region in the fictional Land of Oz in L. Frank Baum's series of sequels of 14 books. First described in The Wonderful Wizard of Oz, this land simply was known as "the land of Munchkins," & "Munchkin Country" in all ensuing Oz books. It is often referred to as "Munchkinland", which was actually introduced in the 1939 movie. Munchkin Country is linked to the Emerald City by means of the yellow brick road. 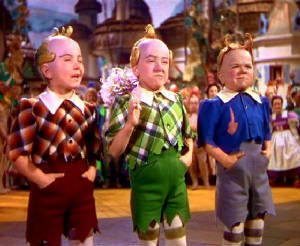 As its name suggests, the inhabitants of Munchkin Country are called Munchkins or Munchkinlanders by means of Gregory Maguire's Wicked novel. On the Yellow Brick Road in Muchkinland Dorothy Gale attends a celebration at the mansion of Boq, the wealthiest man in the district. 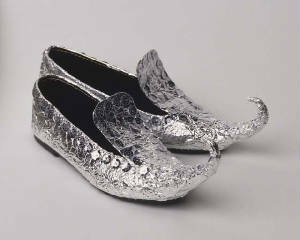 Nessarose Thropp and her father Frexpar became rulers of Muchkin Country due to the fact he made silver shoes for her. Eventually they became laced in magic, and Nessarose held the Munchkins themselves in enslavement. 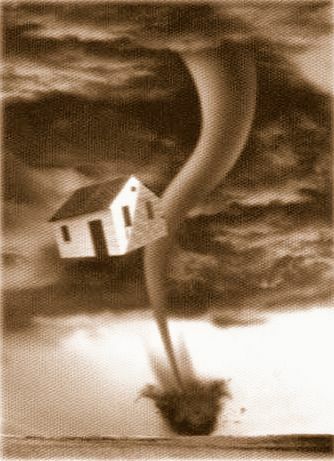 When a tornado hits Kansas and picked up a farmhouse back in the year of 1900 this tornado found its way toward Oz and destroyed parts of this land, according to Gregory Maguire's novel. 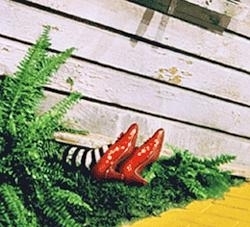 Nessarose, the Wicked Witch of the East was dead upon impact when young Dorothy was inside of her Aunt and Uncle's farmhouse that landed in Munchkinland so many years ago, causing much celebration among the Munchkins. 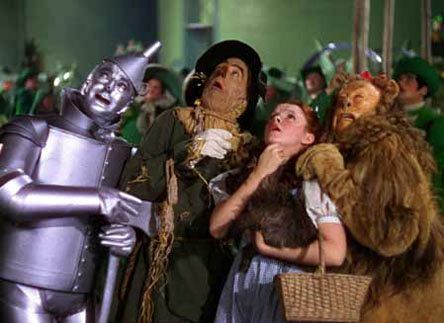 Her journey first started in Munchkinland as she met the Scarecrow, Tin Woodman and Cowardly Lion on her way down the Yellow Brick Road traveling west to get to the middle of the Land of Oz. A place call the Emerald City. Gregory Maguire's 2 novels, Wicked: The Life and Times of the Wicked Witch of the West and Son of a Witch (which use "Munchkinland"), the people are not all Munchkins, and so they are actually called Munchkinlanders. 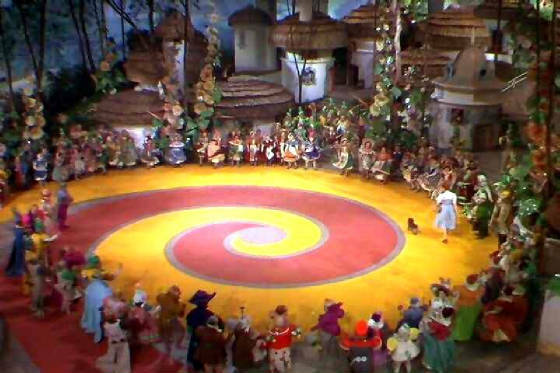 Maguire portrays Munchkinland as the cornbasket of Oz. Munchkinland is shown to be the native home of Elphaba, later known to become the Wicked Witch of the West, and her younger sister Nessarose (although in the novel, they grew up in Quadling Country). 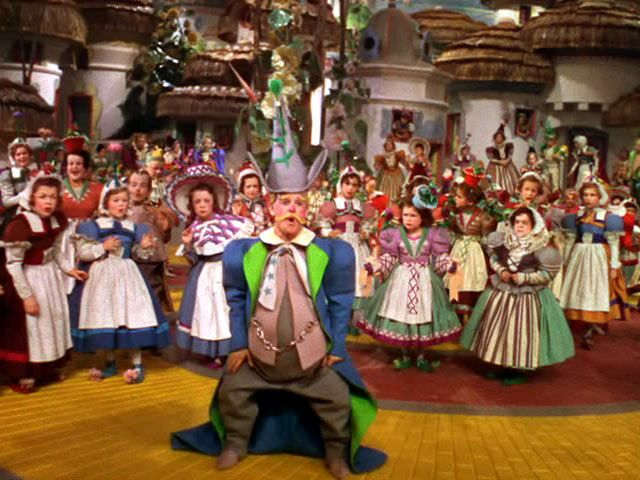 In the Broadway musical Wicked, based on the novel, their father is the governor of Munchkinland. Both adaptations, Nessarose eventually comes to power and rules Munchkinland but her corrupt rule earns her loathing by the Munchkinlanders and the name "Wicked Witch of the East." "Munchkin" doesn't necessarily mean someone who is of small body stature . In Oz it really means a resident of the Munchkin Country. Many Munchkins portrayed in the books are of normal height, most notable being Nick Chopper, also known as the Tin Woodman. Second Oz author Ruth Plumly Thompson's books identified the king of the Munchkin Country as Cheeriobed. He rules from the Sapphire City in the Ozure Isles, with his wife Queen Orin and son Prince Philador. He was introduced by name in The Giant Horse of Oz and made a subsequent appearance in The Wishing Horse of Oz. John R. Neill's Oz books name the Scarecrow as king of the Munchkins, though this contradicts the previous books. He is never shown in this capacity; he is simply stated to be so. To be noted here 1939 marked the year the silver shoes turned into ruby slippers. These ruby slippers/silver shoes belonged to Nessarose Thropp. Henceforth they should have gone to the next of kin, Elphaba, Witch of the West. But, Dorothy Gale was in possession of these shoes and was put on Witch of the West's number one hit list. And she's not only merely dead, she's really most sincerely dead!